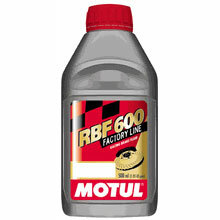 RBF 600 exceeds DOT 3 and DOT 4 specifications, and is a super popular brand of brake fluid around the world. Bottles are filled with nitrogen to extend shelf life and eliminate contamination while factory sealed, allowing you to stock up for those times you will need to open a fresh bottle at your convenience. Extremely high wet and dry boiling points help prevent vapor lock and fade and have been proven by many amateur and race teams to be highly compatible with manual, power and ABS brake systems from a plethora of automotive manufactures. Meets or exceeds all DOT 4 specs -Safe to transport by ground shipping, international shipping unavailable. Copyrighted text and media property of VAC Motorsports and their respective Owners. Any use of proprietary information and/or material from VAC Motorsports or the respective Copyright Owners that is used without permission will result in legal enforcement.